When Yasir was six-years old, following the kidnapping of his brother by the Taliban, his family fled Afghanistan and sought asylum in Australia. Now he represents Australia in para table tennis. World Refugee Day was established to show that the global public stands with refugees. It is held every year on June 20th to commemorate the strength, courage and perseverance of millions of refugees. In 2017, World Refugee Day also marks a key moment for the public to show support for families forced to flee. To mark the occasion, ITTF-Oceania met up with Yasir Hussaini. 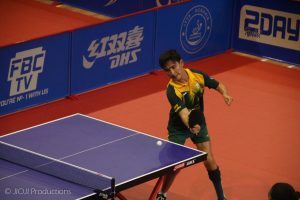 Yasir is a member of the Australian Para table tennis team and also a refugee. When Yasir was six-years old, following the kidnapping of his brother by the Taliban, his family fled Afghanistan and sought asylum in Australia. Families that flee their homeland may be escaping a dangerous situation, but often will have to face uncertainty and peril as they try to reach safety. Yasir’s journey was no different. Refugees and immigration is currently at the forefront of political discussion and policies. When it comes to the public having a better understanding of what it means to be a refugee, Yasir believes it starts with communication and the language we use. Yasir now wears the green and gold, representing Australia in table tennis on the international stage. It was at high school that Yasir had his first encounter with the sport, immediately gravitating to the game. What started out as a bit of fun ended up being more than just a hobby. Sport is always about adapting. But for an athlete with a disability there becomes an extra obstacle to overcome. While Rio Paralympics was only last year, Tokyo 2020 feels like it is just around the corner and Yasir has his eyes firmly set on the representing Australia at the games. Life isn’t just all table tennis for Yasir. He recently graduated from the University of Adelaide and when it comes to his future occupation, Yasir is looking to put his convictions to practice. With more than 10 million stateless people around the globe, now is the time to show your support. Share Yasir’s story and use the hashtags #WorldRefugeeDay and #WithRefugees to show that the global public stands with refugees.